I first read that in 1985. It's a shame it hadn't sunken in by the time of the Decadal Gashuku (training camp) held in the first 2 weeks of 1990. 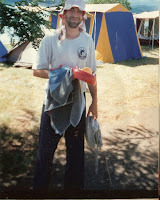 All the fretting I did leading up to and during that camp were worse than the event itself. But this is not to say that we had an easy time. Far from it - as you will see. In my last post "Decadal Gashuku Part 1: The Foreboding" I described our arrival at Midmar Dam in Kwazulu Natal for what was to be a full ten days of training for 10 hours per day. I woke at 5:10 am on the first "official" morning of the camp after a fitful night of tossing and turning on the rocky ground, trying in vain to keep pressure off my severely suburned calves. As a black belt I was one of 4 group leaders, and it was my job to ensure everyone in my team was up by 5:15 am for a 5:30 am start. I knew from past experience that a failure to ensure a full turn-out would fall on the group leader's head. I later discovered that the punishment for this - and any other misdemeanour - involved more exercise; principally running with the kongo ken (a large, oval-shaped iron bar used in traditional karate conditioning exercises). Having roused my sleepy comrades we assembled near the kitchen tent on the lip of Midmar Dam. On that first morning, as with many others, a solitary cloud of fog was eerily suspended just a few feet over the glass-like surface of the water. Otherwise the sky above was clear and crisp, promising yet another day of unrelenting sun and heat. We rubbed our hands and jogged on the spot as we waited for Lao shi Bob. I could feel the blisters on my feet, not yet recovered from my runs in the preceding week. Bob emerged cheerily from his caravan and we headed off down a gravel path, clutching our "buddies" - hand weights cut from reinforcing iron rods - that we were required to carry everywhere we went. That first morning run was a fairly typical introduction; an "easy" 14 km. On other days it varied from as little as 5 km to much as 22 km (more on the "big run" a little later). On one occasion we did an 11 km run that featured stops to do squat kicks, knuckle push ups on the gravel and "fireman lifts" of each other up a steep hill (yet something else on which I'll elaborate in a moment). On the way out we always ran in strict lines of 2 x 2. On the way back we were "allowed" to sprint for the last kilometre or so. Typically the front "pack" comprising Bob, his deshis (apprentices) Wyatt and Tony, ex-special forces troops, and some semi-professional athletes would blast off and leave the remainder in a cloud of dust. On some days I managed to keep up with the front pack and on other days I didn't. When we arrived back at the campsite we were required to run straight into the dam (after removing our shoes, of course). This was to cool our joints and reduce inflammation. After that we would go straight into our first lesson - an hour of basics - comprising things like 1000 kicks or perhaps endless punches and blocks in low horse stance (shiko dachi). On some days we were spared the hard basics and had the chance to groove various push-hands drills from karate, wing chun, white crane and the internal arts (I've retained many of these drills to the present day). Breakfast would follow, prepared by whatever team was on duty. The meal comprised a bowl of maltabela porridge. If you finished that (a big "if" - maltabela - a brown coloured sorghum porridge - is an "acquired taste") you might also get some bread with jam. And to wash it all down we had, of course, our staple gashuku drink, rooibos (a herbal tea brewed from the leaves of the Aspalathus linearis, a bush that grows in the southern Cape). Rooibos is, of course, another "acquired" taste. We were generally given half an hour to digest the food, then it was back to mid-morning training devoted to kata (forms) and then weapons - either arnis (Filipino stick and knife fighting) or Okinawan/Japanese kobudo. Lunch, in the form of sandwiches prepared by whatever team was on duty, came next. The "regular" students then took advantage of the following hour and a half break to sleep off the hottest part of the day - clustered in heat-trapping tents in a desperate bid to find some escape from the searing sunlight. However there was to be no such break for the "decadal" participants; we select few (about 15 of us) had extra training to make up the total 10 hours per day (normally gashukus have "only" 8 contact hours). This "extra time" was the toughest of all; it typically comprised 2 person drills performed barefoot on hot tarmac. I remember stepping as fast as I could to minimise contact with the baking ground. After a short break we would resume the "normal" afternoon sessions which comprised more kata, kumite (sparring) and weapons, as well as hojo undo (traditional conditioning exercises using chi-shi and ishi-sashi, stone (or in our case concrete) weights with wooden handles). Mercifully some of the late afternoon "contact hours" included meditation (which many unofficially used as an extra sleeping session). Dinner was prepared by the teams in giant cast-iron pots and woks. These had to be washed without soap (something to do with the oil that was used in them for cooking). One team somehow managed to forget this rule and were soon seen running around the camp with the kongo ken held high above their heads. Our next meals tasted a bit soapy. The final "contact time" in each day was, for many, the hardest to bear even though it wasn't physically demanding. I'm referring of course to the after dinner "talk around the campfire" which started at 8:00 pm. This was ostensibly a time set aside for discussing matters technical, historical and philosophical. I couldn't help but notice that even 5 minutes into the talk many of the exhausted students would start nodding off (something Lao shi Bob viewed very dimly, to say the least). One had to tread a very fine line in posing questions that would create an impression of interest but not prolong the discussion unnecessarily. I recall asking a particular question to divert Bob's attention from the fact that a young student seated next to him (Damien) had fallen fast asleep. However the question brought a "dagger-like" glance from Deshi Tony who, unaware of my motive, was desperately wanting the session to end. As I've said before, he and I had not exactly started out on the right foot and this merely served to cement his disain for me. That disdain was to manifest itself at the start of the second week on the gashuku. I was sparring with Tony in one of the mid-morning sessions when he caught my leg mid-kick (as can happen). I was expecting Tony to let me land gracefully as befits softer sparring. However he didn't. I caught his eye as we paused for a moment, Tony holding my leg aloft while I hopped about to avoid falling. Then Tony abruptly and decisively swept my supporting foot causing me to crash violently onto the hard African veldt. In fact, my mid-spine fell precisely onto a sharp piece of granite jutting 5 or so inches out of the ground. I was in immediate agony - a pain that was to dog me for the remainder of the camp and many months afterwards. In fact, I still feel the effects today, and will for the remainder of my life. I spent the night tossing and turning in agony, barely able to sleep. The following morning I had no choice but get up and rouse my fellow team mates for the run. Somehow I hobbled through the day, and the next days after it, but every movement was punctuated by pain. Because of my back pain I also started to favour one side. Indirectly this caused one of my knees (which were already sore and unaccustomed to running) to swell. All in all I felt that the camp couldn't end quickly enough. However further disasters were yet to strike. Our otherwise fine weather was in for a change. One or 2 nights after my back injury I awoke from my fitful sleep to a wild storm and a torrent of water flooding over me. Maureen and I went out into the pitch darkness and started digging a trench to redirect the stormwater around our tent. We finished as the sun was breaking and the storm was clearing. Needless to say, everything we had was soaked and muddy. But worse was yet to come. On that particular morning run we again paused at the foot of a hill to do "fireman lifts" with our buddies. Maureen was partnered with a former special forces soldier who went to grab her by her "bad" arm (she was born without most of a scapula on one side). Her protests arrived too late and her shoulder was pulled clean out of its socket, tendons and ligaments snapping and tearing along the way. She spent the rest of the camp with a dislocated shoulder. A few of the ex-army blokes decided to try to "relocate" her shoulder but in hindsight we know that they merely did more damage. A lengthy road trip to a Zululand hospital also met with no success; they took one look at Maureen's private travel insurance and laughed. Her only solace lay in strong painkiller's Bob's then wife had in her medical kit. I am still in awe of how Maureen managed, arm in a sling, to continue with the camp. In fact, her shoulder was not relocated and fixed until she had the requisite surgery some time after we arrived back in Perth. 1. Tsunetomo, Yamamoto; Wilson, William Scott (translator) (2002). Hagakure: The Book of the Samurai. Stackpole Books. ISBN 4-77002-916-0. 2. When I was in Taiwan recently we had the option of having a massage in the hotel to ease the aches and pains of 8 hours of training each day. Stupidly I didn't avail myself of this opportunity; all my Chen Pan-Ling brothers and sisters swore by it. I still remember the masseuses - one for each of the participants of our course - arriving at our hotel on the backs of scooters, then being led to the elevators. When I say "led", I mean literally; they were all blind. It seems some cultural trends in the Hagakure (eg. massage being a profession predominantly for those who have impaired vision) are still visible in the Far East to this very day. Very interesting reading. I told my teacher recently that I wanted to do a 'gasshuku' before my knees were too old to take it. I'd never willing sign up for one verging on abusive, such as the one you experienced. Thanks for the heads up. Without the vertebra fracture and the dislocated shoulder, it really wasn't too bad! Think "Survivor Africa" but easier. The ex-special forces guys said it was "like a luxury holiday"! Aside from Tony's sweep of my foot (which I think he did recklessly rather than maliciously) there wasn't any "abuse" as such. Bob was always cheery! "Looking back, I'd handle it very differently today." Well Jorge, I've answered your question in my post "Decadal Gashuku Part 4: The Aftermath"! One of the reasons why safety is such an important concept that transfered to me from my original instruction, is that you can't train when you're injured. Thus it's pointless to do things that have little benefit but high risk.